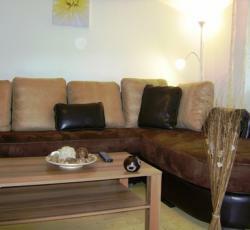 Comfortable and modern apartment in the Berlin's district Charlottenburg. Villy-Berlin is situated in a quite and central area, close to the river Spree, the historical City Hall of Charlottenburg, Charlottenburg Palace, ICC Messe Berlin, Deutsche Oper, Kurfuerstendamm (Ku'damm) boulevard, KaDeWe, Technical University, Berlin Zoo and the Tiergarten district. In the immediate vicinity, you will find some big supermarkets, bakery and restaurants. Lowest prices, no booking fees. The apartment was properly equipped and very comfortable! Very very good price! The sofa-bed in the spacious living room was very comfortable, bedroom was small but adequate. The apartment was very clean and had everything we needed for a comfortable stay for 4 individuals (2 couples), including free wi-fi and satellite tv. Very comfortable location in the beautiful area of Berlin - Charlottenburg. I would go here again myself and would definitely suggest it to other people. Thanks! Really very good for this price. Quite a lot of space, really cheap. Location is good. Personel was really pleasant. A lot free parking places near the flat. This apartment was so beautiful, it was basic to get around, close to markets and also the metro, and so cheap! This apartment was so beautiful, it was basic to get around, near to supermarkets and the metro, and so cheap! Staff is extremely friendly. The apartment is wonderful! And it&'s extremely clean. Staff is very friendly. The apartment is wonderful! And it&'s very clean. * Villy-berlin rated 4.9 out of 5 based on 10 customer reviews. Hostel reviews with a star rating are sourced from HostelBookers. If you find Villy-berlin with the same booking conditions at a lower rate somewhere else on the internet after you have booked, we will refund you the total difference.